Firstly, as a relative newbie to the pet blogosphere, today marks my inaugural Saturday Pet Blogger Hop, and I hope to meet many new animal-lover friends! You can learn how to create photos like this here. On Monday, Feb. 21, I'll pick my favorite caption and give the winner a shout-out on my blog. Thanks for participating; you rock! * Only one comment per person, please. ** Please visit The Daily Corgi for more information about DM research and The Drive for Five. Oh, wait! I missed a spot. I am so excited to see the corgi folk (both breeds) getting together to support research into this debilitating disease -- good for you for adding your help. Suddenly, it became clear to Felicity... Robert did have an "other woman." She knew the neighbours' tongues, not tails, would wag. You've got a little somethin'...slurp....right....slurp...there. Okay, got it! ...you SAID it tasted just like CHICKEN! Just checking for fever... I think you'll be OK.
First of all, welcome to "blogland," and the Saturday Hop! As for a caption, I would say, "Nothing says I love you like a big, sloppy kiss!" Have a great weekend!! You had me at "slurp!" Hi Elizabeth! I have no caption, I just wanted to say I love your blog and your dogs are gorgeous and thanks for stopping by my blog : ) Fun hop, eh? I LOVE Corgis - some of my very favorite patients and friends! Corgi Blessings from an Angel With fur! "She loves me....she loves me not, she loves me...she loves me not....she LOVES ME!" 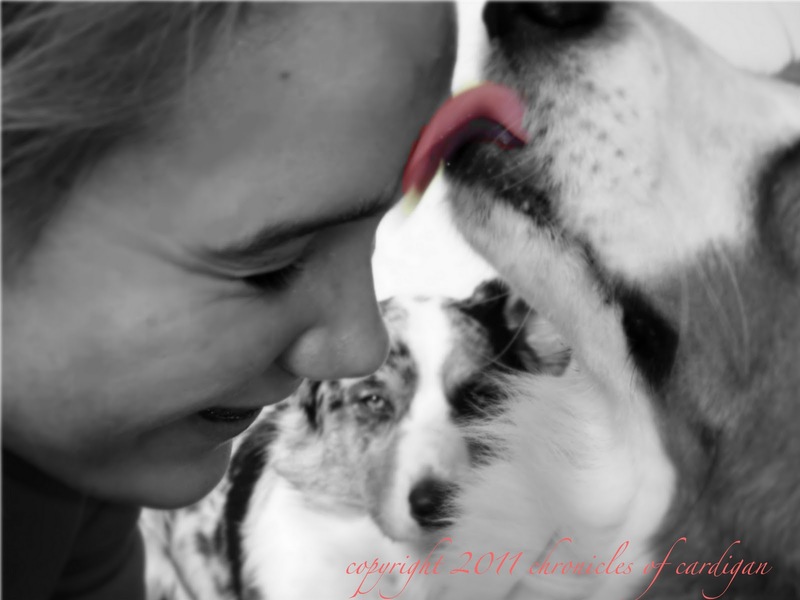 I have a great blog I'd love for you to check out, www.PetBlogsUnited.com. It's a wonderful place for pet bloggers to find each other! Dog 1:"Oh, I lick you so much...oops, I mean I like you! How embarrassing!" Dog 2 rolls eyes (again). Thanks for stopping over at The Other Winnie Cooper and commenting! Your corgis are gorgeous. DM is a serious diease. I'm glad you are showing such strong support for its research! I test all my dogs! ...Ok, ok, I love you too! First, welcome to the Saturday Blog Hop! It's nice to meet a new blogger! Now for my caption: "I now anoint you Girl of Sweetness. From now on that will be your native dog name." Who needs high price cleansers...I'll wash you face! "Why don't you take a picture. It'll last longer." Stopping by from the Pet Blogger Hop...so generous of you to make the donation! That's what we always say in our house. :) Thanks for stopping by Banjo & Millie to say hi on the Pet Blog Hop. Hope you had fun on your first one! Love your blog, and glad to have met you. We're new followers! Nothing tastes as sweet as love. "True love always waits...its turn!" =) Love what you're doing (and love always seeing great pics and posts about your beautiful boys!). Keep 'em coming! "You've been workin' awfully hard -- let me cool your brow for ya." Mitsy was never happy with Brian's affection for the human kid, so she bid her time waiting for the day...that one special day when...Oops! The human is watching!